To day I started work on carving the body. Because of the way I've chosen to set the wings so low on the iron the point at which they join the body must naturally also be quite low. I've fiddled in photoshop to simulate what that area will look like when it's done because the open area there is a bit distracting right now and I wanted to present an idea of what I'm working towards. Although the point of attachment for the wings is very low I've been able to leave the head, and more importantly the eyes, quite raised. The abdomen is also quite proud of the surface, almost completely 3D in effect. The eyes are done in black lip, mother of pearl and seem to work rather well. I've given the body, which is shakudo, a bit of colour like it will be when completed. I intend to inlay a pattern along the body, in gold. The wings at this stage look a bit garish but there I will be engraving my "new and improved" vein pattern on them and filling the very fine lines with black lacquer. This will hopefully bind the black and gold body and the black and gold wings together as a whole. The wings are now close to their final thickness and are showing some lovely flashes of green and pink. I thought it was about time I introduced some of the inspiration I have drawn on in my studies of the classical tsuba making tradition. 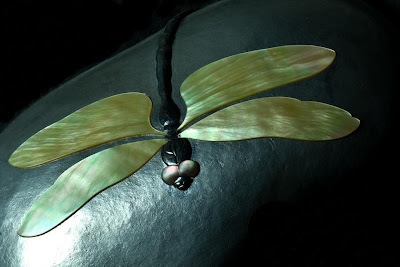 In this case the particular use of mother of pearl as an inlay material in metal. The artist generally credited with this innovation is Murakami Jochiku, who died at the close of the 18th century. Unfortunately we don't know when, or where he was born nor much about his metalworking lineage. We do know that he had about 10 pupils, 2 of them being his daughters, Jotetsu and Josui. We can also recognise a genuinely original artist of this tradition. 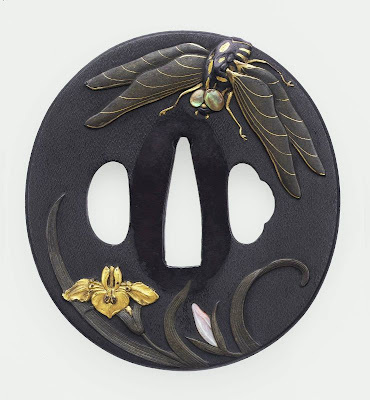 The tsuba illustrated above ( borrowed from the Museum of Fine Art, Boston's on-line gallery ) displays his 2 most recognisable traits. The mother of pearl inlays are used to very effectively depict the eyes of the insect as well as the delicacy of the narcissus bud. The background texture is also very much associated with his work. This fine, crepe-like, texture is called chirimen in Japanese and refers to the silk fabric that this emulates. It creates a very different visual feeling from the more formal, perhaps even rigid, nanako ground. The design itself is worth commenting on too. If you consider when this was made, sometime in the second half of the 18th century, I think it remarkable how much it seems to prefigure the European Japonisme expression of the late 19th century's Art Nouveau movement. The reality, of course, was that Japanese artists were engaged in a continual reinvention of design modes and this, bolder and more elegantly flowing style, fits perfectly within that development. When European designers and artists first encountered Japanese art they had no way of placing the individual items they saw in any sort of historical or aesthetic context. It was all just so exotic, and novel, that it was impossible to comprehend the Japanese artistic heritage in it's entirety. The unfortunate consequence of this is that it is still regarded, by far too many artists and designers today, as a sort of exotic design source catalogue with no real appreciation of the logic of it's own aesthetic developments. In my opinion, the only way to begin to develop a genuine appreciation of the art of this tradition is to go beyond the unusual materials, techniques and subjects, and to try to feel the aesthetic urge that is being explored and expressed. To try to comprehend how these inventive artists achieved their aims and what those actually were.